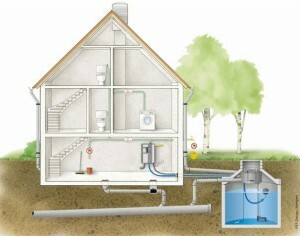 Rainwater harvesting is the accumulation and storing, of rainwater for a later use. Once collected it can be usedfor a variety of uses. Irrigation, toilets, laundry, cleaning, fountains, commercial applications and even drinking. Rainwater Harvesting is amore environmentally correct solution to free water then a well. Well water can also contain minerals that may have to be treated before use. Wells draw down the water table which can lower rivers and lakes, as well as run dry. Ground water can be from decades to hundreds of years old. How long will it take to replenish that water. By storing rainwater you helpreduce the initial stormwater runoff from impervious surfaces, which helps reduce the strain on our infrastructure, save energy and provide you with your own water to use as you please. Rainwater harvesting is the accumulation and storing of rainwater for a later use before it hits the ground. Rainwater Harvesting is a more environmentally correct solution to extend our water supply then building new reservoirs or expanding current reservoirs. Its a very clean water. Much of our surface water is collected in reservoirs after washing all the pollution off the ground, non point pollution. It then must be treated and pumped back to us for use. 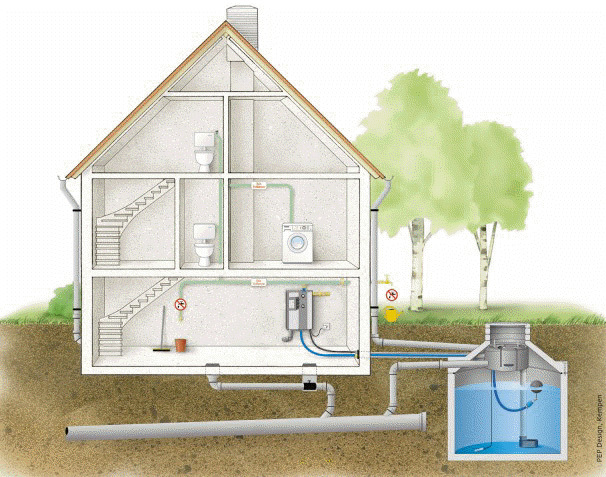 Rainwater harvesting collects the water before most of the pollution gets to it making it much easier to clean. By storing rainwater you help reduce the initial stormwater runoff from impervious surfaces, which helps reduce the strain on our infrastructure, save energy and provide you with your own water to use as you please. Rain water comes from the heavens. What could be better then that? The quantity of rainwater collected can be estimated. From each square foot of the foot print of the building .642 gallons of water will land on the roof per inch of rain. Of that about 15% will be lost to wind, deflection and evaporation. By using a simple formula of 1/2 gallon per square foot of roof area for each inch of rain you can estimate your water capture. For example a 2,000 square foot roof will collect over 1000 gallons of water per 1 inch rain event and a 250,000 square foot roof will collect over 125,000 gallons of water. Rainwater Harvesting is the more environmentally correct solution to free? water then a well. Well water can contain minerals that may have to be treated before use and the cost of energy to pump water sometimes hundreds of feet to the surface can be significant. Wells draw down the water table which can lower rivers and lakes and can run dry. Ground water can be from decades to hundreds of years old. How long will it take to replenish that water. Price is the biggest issue in purchasing a rainwater harvesting system and tanks are what makes up the bulk of the price. We price our systems by the gallon. Systems start at 500 gallons above ground and 1500 gallons underground. Systems usually run from $1.50 to $5 per gallon. Tanks can be installed up to 700,000 gallons. The smaller the system generally the higher the price per gallon. Installation, integration, access to site and aesthetics are factors considered when pricing a system. This seems like a lot of money, but the systems should last 20 years or more only requiring maintenance to keep them clean and working. Water seems to be relatively cheap and plentiful, but when there is a drought it can be priceless. Rainwater when properly captured and stored should be of potable quality providing an emergency source when needed. Wells can cost thousands of dollars and the water usually contains minerals and salts. The quality of rainwater is what plants thrive on. Rainwater can increase plant growth more then 20-30% when compared to municipal and well water. The life cycle cost and the piece of mind knowing your plants are protected from drought with quality water and environmental stewardship should be reward enough for your investment. Once collected it can be used for a variety of uses. Irrigation, toilets, laundry, cleaning, fountains, commercial applications and even drinking.